Dr. Inga Winkler is a lecturer at the Institute for the Study of Human Rights at Columbia University. Her research agenda is held together by her interest in socio-economic rights, development, gender, social justice and substantive equality. Current research projects focus on the Sustainable Development Goals and human rights, the UN Special Procedures, menstrual health and wellbeing, and the human right to sanitation. Her books include the first comprehensive monograph on the human right to water published in 2012 and an edited volume on the Sustainable Development Goals, and her articles have appeared in the International Journal of Human Rights, the Journal of Human Development and Capabilities, the Columbia Human Rights Law Review, and the Human Rights Law Review among others. It seems like everyone is talking about menstrual health these days. But WHAT and WHO are we missing? 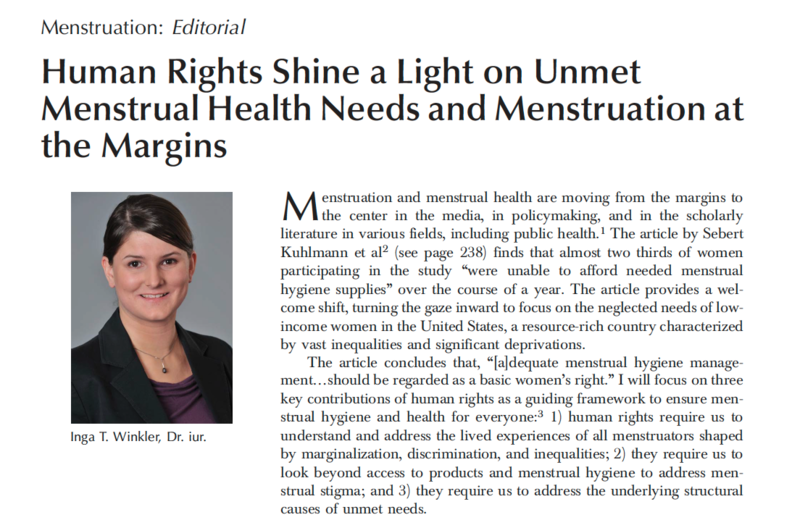 My recent editorial in Obstetrics & Gynecology discusses how human rights shine a light on unmet needs and menstruation at the margins. My graduate students have completed fascinating research projects, including four theses that provide fresh perspectives on current developments in menstrual studies. Congratulations Trisha, Sydney, Tori, Anna and Sabrina!